Rose Oil - What Should I Know About It? Rose oil is an essential oil commonly used in aromatherapy. It contains the rose plant's aromatic compounds, which are thought to possess certain healing properties. According to aromatherapy practitioners, inhaling essential oil molecules (or absorbing essential oils through the skin) transmits messages to the limbic system (a brain region responsible for controlling emotions and influencing the nervous system). These messages are believed to affect biological factors such as heart rate, stress levels, blood pressure, breathing, and immune function. For a 2008 study of 52 women undergoing menopause, researchers assigned 25 participants to weekly massages with several essential oils (including lavender and jasmine oils in addition to rose and rose geranium oils). After eight weeks, the study members who received massages reported a significantly greater improvement in menopausal symptoms (such as hot flashes) than those who weren't massaged. However, the study authors were unable to attribute the positive effects to aromatherapy, massage, or the combination of the two therapies. Topically applied rose oil (when combined with lavender and clary sage oils) may be effective in decreasing the severity of menstrual cramps, according to a 2006 study of 67 female college students. For the study, a blend containing one drop of rose, two drops of lavender, one drop of clary sage, and 5 ccs of almond oil was applied in the form of an abdominal massage. Rose oil should not be taken internally without the supervision of a health professional. 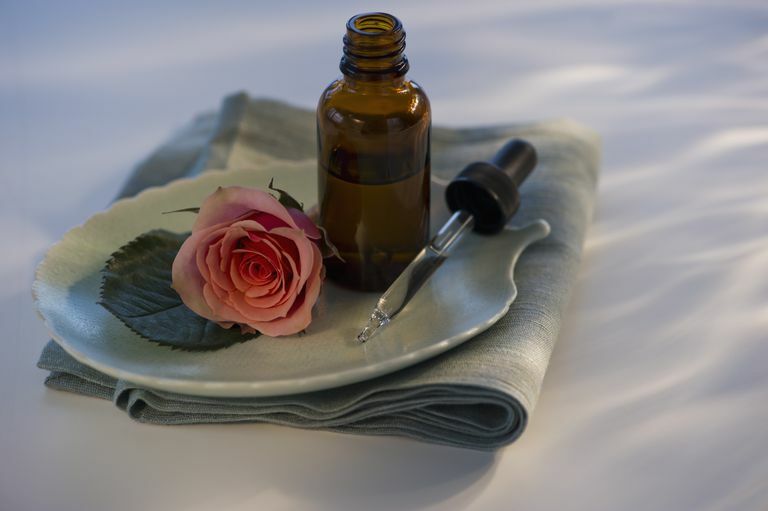 Internal use of rose oil may have toxic effects. Additionally, some individuals may experience irritation when applying rose oil to the skin. It should not be applied full strength to the skin. It's important to educate yourself about how to use essential oils safely. Due to the limited research, it's too soon to recommend rose oil as a treatment for any condition. If you're considering using it, talk to your doctor first. Keep in mind that alternative medicine should not be used as a substitute for standard care. Self-treating a condition and avoiding or delaying standard care may have serious consequences. de Almeida RN, Motta SC, de Brito Faturi C, Catallani B, Leite JR. "Anxiolytic-like effects of rose oil inhalation on the elevated plus-maze test in rats." Pharmacol Biochem Behav. 2004 77(2):361-4. Han SH, Hur MH, Buckle J, Choi J, Lee MS. "Effect of aromatherapy on symptoms of dysmenorrhea in college students: A randomized placebo-controlled clinical trial." J Altern Complement Med. 2006 12(6):535-41. Hongratanaworakit T. "Relaxing effect of rose oil on humans." Nat Prod Commun. 2009 4(2):291-6. Hur MH, Yang YS, Lee MS. "Aromatherapy massage affects menopausal symptoms in korean climacteric women: a pilot-controlled clinical trial." Evid Based Complement Alternat Med. 2008 5(3):325-8.